Opening Sentences: It’s Sunday afternoon, and the phonograph player is jumping like a clown in a parade the way Jolene and I are dancing. Synopsis: Ida Mae Jones is 18, cleaning houses with her friend Jolene, and dreaming of the day when she can get her pilot’s license, like her daddy who is dead, when Pearl Harbor is bombed and the war interrupts her dreams. Suddenly, everything must be focused toward the war effort. One African-American girl in the South dreaming about going to Chicago to fly hardly seems important when her brother and so many others are going off to fight and likely die. When Ida Mae’s kid brother shows her a newspaper article about the WASP – Women Airforce Service Pilots – and innocently suggests that’s what Ida Mae should do, an idea begins forming in Ida Mae’s mind. But has she the gumption to pull it off? She is light-skinned. Jolene says she could pass for white. But that would mean crossing a line that would change her whole life. Still – she could fly. She could contribute something more to the war effort than saving bacon fat and doing without silk stockings. She could help ferry warplanes to where they were needed. She could be of use – as long as no one figured out she wasn’t really white. Ida Mae and Jolene manage to alter Ida’s father’s pilot’s license, and Ida Mae is off to Sweetwater, Texas, with a dream, and a lot of hope that she can carry this through. If anyone guesses the secret of her race, she would be in big trouble, and quite likely in danger. The South in those days was an unforgiving place for those who challenged the racial barriers. Flygirl tells the story of Ida Mae’s time in training, with details that make the period and the experiences come alive. Even if readers know next to nothing about flying an airplane, they will be drawn into the story through Ida Mae’s first-person account of what she goes through day by day. Although there is no record of an African-American woman having been a part of the WASP during World War II, the book is so well-written, that one feels it could have happened. For Further Enrichment: There is a website called WASP on the Web with resources, press releases, articles, videos, arcade games, and more. There is a National WASP World War II Museum near Sweetwater, Texas, where the WASP training was held. It has a website with a photo gallery and more. 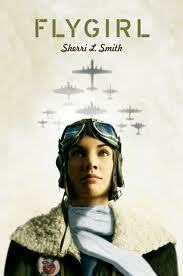 On January 1, 2014, the Women Airforce Service Pilots were honored in the Tournament of Roses Parade in Pasadena. This article in the online version of Flying magazine tells about that tribute. This sounds like a great read, Beth! Isn’t it always those innocent, off-hand comments that get the wheels spinning 🙂 And it sounds like it would be very exciting, what with Ida Mae having to keep her race hidden while learning to be a pilot! I’ve hear od Ida Mae. I’m glad that there has been a YA novel written about her life and accomplishments for young people. There is so much they don’t understand about how women, like Ida Mae, broke barriers. Am very glad to know that this book exists. Nail biting reading indeed. I would love to get my hands on this. So muc for Ida Mae to overcome in her quest. One is already sitting on the edge of their seat. Thanks for sharing. I really like reads about girl heroes. This one sounds excellent! Thanks for sharing!